Telegraphist Lars Kålland in discussion with Alexander Association Chairman Jan Steinbach, before the transmission. 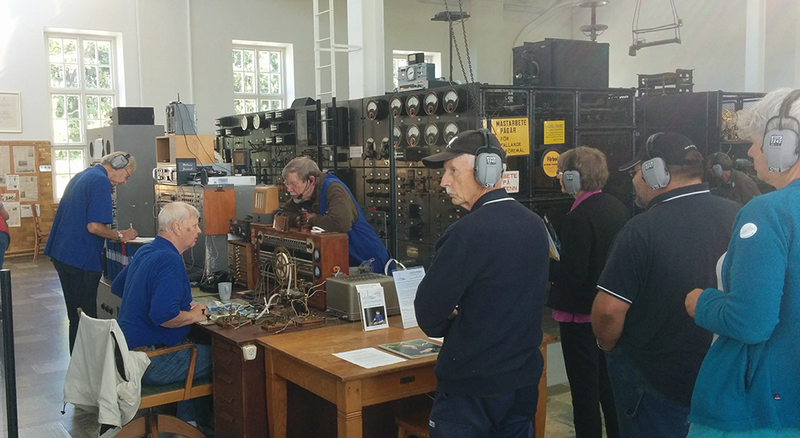 On the occasion of the 11th nordic shortwave conference HF 16 with the attached longwave symposium LW 16 on the small island of faaroe north of Gotland in the baltic sea, an extra transmission was made from the World Heritage Grimeton Radio Station (SAQ) on Tuesday, August 16th, 2016. The transmitter startup began at around 09.15 UTC (11.15 local time), and the transmission of a message on the frequency 17.2 kHz CW, was started at 09.40 UTC (11.40 local time). No QSL cards was given at this time, however, several listener reports was received by E-mail. The transmission was heard all over Europe, reports was received from Germany, Sweden, Italy, Switzerland, France, Russia, United Kingdom and Denmark. – Thank You All Listeners! A live video stream was also available during the event. Please visit our YouTube Channel to see a recording of this event and additional videos from previous events. Many listeners reported a clear and strong signal, this time. During the test transmissions earlier the same morning we initially struggled to get enough output, maybe due to moisture in the antenna system. However after a few tries, the output became stronger and stronger, as can be seen on the graphic below. Please visit http://www.df3lp.de/ for more information on this and other historic transmissions, dated back as far as 2010. E-Field probe, located: 54°22’24″N 10°08’15″E in Kiel, Germany on frequeny 17.2 kHz on 2016-08-16.